5a: Kirei hits the opponent with his open palm. Hits mid. 5b: Kirei kicks his opponent with his knee. 5c: Kirei steps forward and punches his opponent. 2a: Kirei swings at his opponent's feet with his fist. Hits low. 2b: Kirei tackles hits opponent, tripping them. Hits low. 2c: Kirei kicks upwards. Launcher. Hits mid. j.a: Kirei hits downwards with his open palm. Hits high. j.b: Kirei does a spinning kick. Hits high. j.c: Kirei slams downwards with both his fists, slamming the opponent into the ground. Hits high. 6c: Kirei dashes forward and does an overhead punch. Must be blocked high. 236a/b/c: Kirei throws Black Keys that move slowly a moment before speeding up. Depletes the Black Key meter depending on the number of Keys thrown. a version = Kirei throws one Black Key upwards at a 45° angle. b version = Kirei throws one Black Key forward. c version = Kirei throws two Black Keys; one forward, the other upwards at a 45° angle. j.236a/b/c: Kirei throws Black Keys that move slowly a moment before speeding up. Depletes the Black Key meter depending on the number of Keys thrown. a version = Kirei throws one Black Key downwards at a 45° angle. Retains jump trajectory. b version = Kirei throws one Black Key forward. Slows his fall. c version = Kirei throws two Black Keys; one forward, the other downwards at a 45° angle. Slows his fall. 214a/b/c: Punch/kick series. Follow up the first punch/kick with a different version, and then end with any of the finishers. a version = Kirei steps forward and slams his opponent with his elbow. Hits mid. b version = Kirei steps forward and slams his opponent with his open palm. Hits mid. 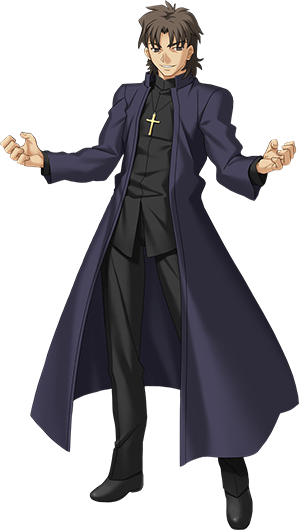 c version = Kirei steps forward and kicks at his opponent's feet. Hits low. a version finisher = Kirei steps forward and slams his opponent with his open palm. Hits mid. b version finisher = Kirei does a handstand and kicks his opponent into the air. Launcher. Hits mid. c version finisher = Kirei steps back, then quickly lunges forward, punching his opponent and knocking them down. Hits mid. 623a/b/c: Kirei moves forward and does a series of upward kicks. Launcher. a version = Kirei does two kicks and launches the opponent high. b version = Kirei does two kicks and launches the opponent to his head level. c version = Kirei does two kicks, launches the opponent to his head level, then kicks them into the ground. Requires meter. 421a/b/c: Kirei jumps forward and grabs the opponent, doing a somersault and slamming them into the ground. Command throw. a version = A bit less range than b version. b version = Midscreen range. c version = A bit more range than b version. 646c: Kirei dashes forward and turns, slamming his opponent with his elbow and pushing them back. Hits mid. 22c: Kirei stomps on the ground, sending waves of darkness in all directions. Hits low. 236236a: Kirei punches the opponent, then follows up with a roundhouse kick and an elbow slam, and finishes with a Gandr shot. 2400 damage. 236236b: Kirei releases the darkness of the Grail from within him. 2400 damage. For the duration, his normals and specials (not supers) do 20% more damage. AA6BC: Kirei corrupts the opponent using the Holy Grail, which then devours them from within. 4000 damage. Kirei has a strong okizeme game against cornered opponents. One successful mixup leads to the deadly kick loop. 2a: Hits low and goes straight into his corner combos. 2a is fast and has good range. This is quite possibly the most obvious choice if a meaty j.236a connects or if the opponent is blocking high. 6c: Kirei's 6c must be blocked high. On hit, you can RC it and go straight into his corner combos. 6c > RC (before 6c hits) > throw: If your opponent gets scared into blocking the 6c overhead, you can RC it before it connects and throw the opponent. Kirei can combo after his throw against cornered opponents. Simply pick the opponent up with either 2a or 2b and go into the combo of your choice. 22c: This move also hits low, but the difference is that it has more range than 2a and it's completely safe against reversal attempts when spaced properly. On hit or CH, you have ample time to run up and combo. If you do it early enough, you can whiff this attack and run in and throw since it recovers so quickly. If the opponent push blocks, you can 421a/b to close the gap and catch them. Be sure to combo after the B version.